Open Outlook 2011 and select Accounts from the Tools menu. In the Accounts window, click the account you wish to edit. Under Server information ensure mail.livemail.co.uk is set as your incoming server and tick Use SSL to connect (recommended). Make sure Override default port is not selected. If you are editing an Advanced mailbox you should ensure smtp.livemail.co.uk is entered into the Outgoing server text box. Select Override default port, enter 465 in the port box to the right of the Outgoing server, and make sure Use SSL to connect (recommended) is selected. Click the close icon in the top left to close the window. Outlook 2011 is now configured to connect using SSL to your mailbox. Finally we recommend that you send a test email to yourself. Doing so will simultaneously check that you can both send and receive an email using these new settings. 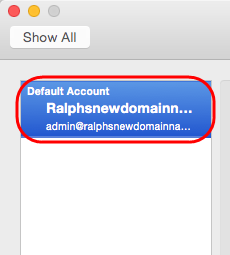 All you need to do is compose a new email and send the email to the same address you have just configured. In a few moments you should see your test email appear in your Inbox.